Pharm. Ahmed Yakasai, the President of the Pharmaceutical Society of Nigeria (PSN) ; Dominique Jordan, President, International Pharmaceutical Federation (FIP), Mr. Emeka Duru, Secretary PSN President, and two others after the World Congress of Pharmacy and Pharmaceutical Sciences in Glasgow, UK, which ended at the weekend. Pharm. Ahmed Yakasai, the President of the Pharmaceutical Society of Nigeria (PSN) and Dominique Jordan, President, International Pharmaceutical Federation (FIP) have held a strategic meeting to fashion out a roadmap for the development of pharmacy profession in African continent, especially Nigeria. The duo met when Yakasai visited Jordan to congratulate him on his emergence as the President of FIP after the World Congress of Pharmacy and Pharmaceutical Sciences in Glasgow, UK, which ended at the weekend. 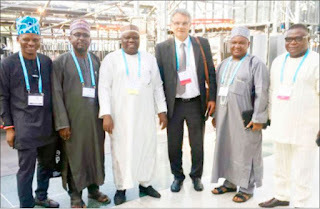 According to the PSN boss, the newly elected FIP President invited him for a consolidation meeting to parley on how they could contribute to the development of pharmacy profession in Nigeria in particular and Africa in general. LAGOS – Pharm. Ahmed Yakasai, the President of the Pharmaceutical Society of Nigeria (PSN) and Dominique Jordan, President, International Pharmaceutical Federation (FIP) have held a strategic meeting to fashion out a roadmap for the development of pharmacy profession in African continent, especially Nigeria. The meeting was geared to emphasised training and leadership development for innovations in disseminating new knowledge through the identification of key competencies or skills sets and targeting special interests in the different fields of pharmacy. The congress was organised by the FIP Hospital Pharmacy Section and the FIP Board of Pharmaceutical Sciences. The organisers said that the congress brought together pharmacists from around the world to consider ways of extending the role of pharmacists so that they can play a full part in ensuring that patients and health systems, achieve full benefit from the medicines people take. According to them, the goal of the congress was very timely especially as the ‘one-size-fits-all approach is clearly failing many patients around the globe for the pharmacological treatment of diseases. Pharmacists are uniquely trained and qualified healthcare professionals capable of personalising therapy for improving patients’ outcomes. According to them , Pre-congress Satellite on Biosimilars which took place on Saturday is the science, regulation, practice and education of follow-on biologic pharmaceuticals. It was organised by the FIP Hospital Pharmacy Section and the FIP Board of Pharmaceutical Sciences, Marianne Ivey (FIP Hospital Pharmacy Section, USA) and Michael Ward (FIP Board of Pharmaceutical Sciences, Australia) Chairs. Biologic pharmaceuticals are very targeted medications that have made a major contribution to the clinical outcomes of patients with challenging diseases and conditions. These pharmaceuticals are very expensive and competition from products that are biologically similar has the potential of increasing patient access at a lower cost. The complexity of the science and practice of using these medications makes pharmacists’ education of these agents critical to their appropriate use. This pre-congress satellite was expected to address these areas with active learning opportunities for the audience. Also, the organisers said that this year’s congress in targeting special interests featured the 37th Global Pharmacy Technicians’ Symposium on Partners in health. The symposium’s theme was “Partners in health.” Discussions at the symposium focused on education programmes and services that have evolved and served to define pharmacy technicians and other pharmacy support workforce groups in a variety of contexts globally, particularly as part of the global mid-level health workforce cadre. The self-study learning activity was designed to ensure that all participants understand vaccine-preventable diseases and the role of pharmacists as vaccine advocates and administrators. The learning modules presented in-depth information on immunology and practice implementation and included real-life case studies designed to help reinforce and evaluate participants’ understanding of key information and concepts. He tasked young pharmacists with interest in taking up future leadership roles within the YPG steering committee or being involved with local or national YPG leadership activities to attend the pre-congress workshop. Yakasai assured that participants interested in elections would be able to hear and ask questions about the specific roles and responsibilities of the current YPG Steering Committee.